Just posting that the first and longest of Ruth’s letters is posted. Over 30 pages long, because she doesn’t have Walt’s mailing address yet, it’s a good introduction to the lives of family who waited at home while their loved ones went to war. All of Ruth’s letters will be listed on this page as they are completed. After finishing transcribing all 359 of Walt’s letters, I fell into a winter slump. Let’s call it a vacation. I’ve crept back into transcribing by working on those two pilot logs (log1, log2), and now I’m starting on Ruth’s Letters by scanning them and filing them into folders—I hate that part. Walt mentioned a few times that he was returning her letters for the scrapbook she planned to work on (but never did). 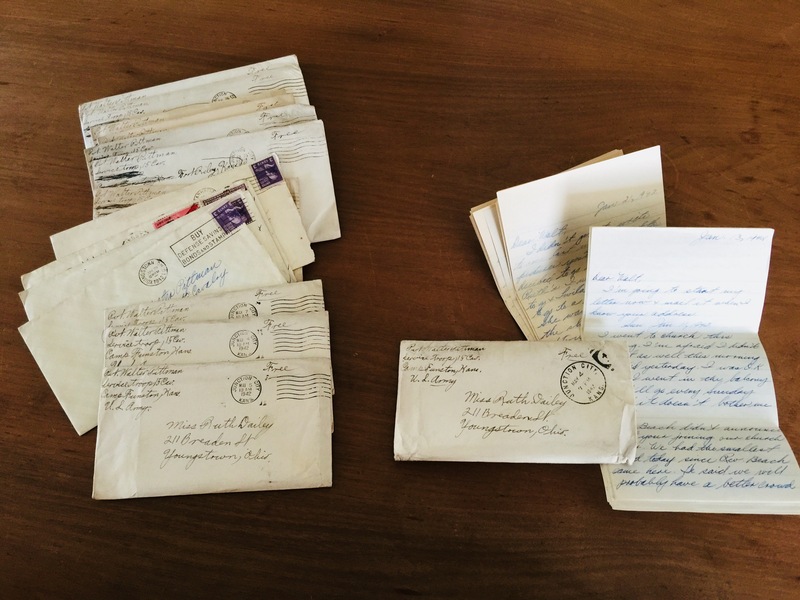 Most of her letters were bundled into envelopes, except for four that were returned to her in their original envelopes. She might have picked those up when she went out to visit him. The last bundle is dated 26 July 1942. Walt doesn’t head out to Texas until November, so it’s unclear why the returning ended in July. Nevertheless, that’s all there is. Walt and Ruth would be together after December, so there was no need for letters in 1943. The war obviously made it unlikely that Walt could return any letters received overseas. Beyond that, I don’t know what happened to the idea of the scrapbook, even though there is a large one with photos of other soldiers in it. My scanning plan is to scan all of an envelope’s contents into one PDF. For the transcribing, though, I’ll do that one letter at a time, with each letter page in JPEG format. Bear with me. While there is nothing new to read, imagine me scanning and organizing.